I love seeing books about dads and their daughters. This relationship isn’t common to see in picture books but when its done right, it’s something special. Check out Ten, Nine, Eight by Molly Bang for another great one. Sidewalk Flowers features wordless comic strip-like panels that show inner city life. The pages are gray, black and white save for a bright streak of red for the girl’s cloak and oh, if you look closely…is that a flower growing quietly? A young curious girl explores her city while holding her father’s hand on a walk to run errands. He’s often on his phone but she’s tuned into the bustle, the people and the flowers. They are still connected though and she’s busy collecting her flower prizes. As they walk through the park, she gives a small gift for a fallen friend, a dozing friend and hairy friend. She brings color to what she touches and the pages slowly bloom. Initially Smith’s illustrations highlight contrasting black and white lines, but he throws in moments of color as the story progresses. His watercolor illustrations are great and vibrant; it’s not a busy kind of vibrant but rather a comfortable vibrancy. The father and daughter enjoy each other’s company and its easy to see how much the girl is a part of her community and how much she is loved. Whether escaping war, oppression, famine or discrimination, the United States has long been a place for new beginnings for people all over the world. Safe in our homes, it can be hard to put ourselves in the shoes of others, in the shoes of people who are fleeing their old life to make something better. Can you imagine being plucked from your home and while trying to hold on to what you know and understand, being placed in an entirely new (and sometimes scary) environment? Reading Here I Am reminded me of the struggles of Syrian refugees trying to make new homes in various countries around the world. In this book, a young boy and his family leave Korea to make a new home in the US. This wordless picture book is inspired by the author Patti Kim’s experience leaving Korea at four years old to travel to the US. Her story, combined with Sonia Sánchez’s expressive and energetic art, is a moving tale of immigration. In Here I Am, a child steps off a plane with his red seed from home tucked safely inside his pocket. It’s easy to see his confusion and reluctance to adjust to his new life. The words on sign posts and restaurants are a jumbled mess and all he hears from his teacher is “Blah Blah Blah” but…his red seed is comfort. He holes away in his family’s apartment, not ready to explore UNTIL…he drops his precious seed out the window and a girl picks it up and goes off with it! As he rushes down the stairs and begins to explore his city, he realizes how fascinating his new home is. Like his seed, he blooms and grows with his new friend, the new connection he makes in his new home. This book is excellent for discussing difference, feelings and change and I hope you will keep this story with you! I’ve mentioned earlier how much I love a bold line and simple images that “pop.” Well, I also love DETAILED illustrations. David Wiesner is a master at storytelling through skilled detail. 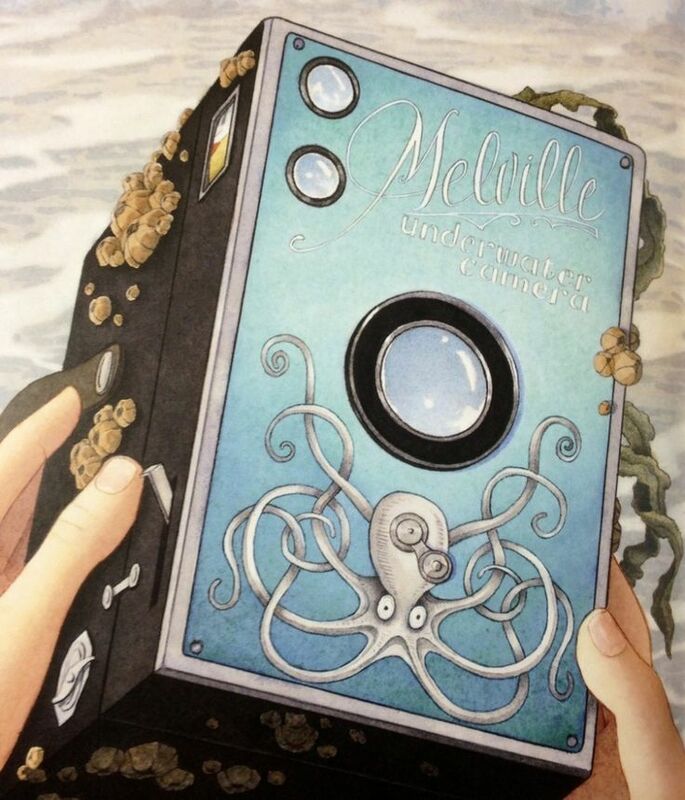 I love his book Flotsam and it’s very easy to see why this book won the 2007 Caldecott Medal. This book is wordless. The lack of words encourage imagination and the illustrations have so much packed into them that you can come up with various interpretations of what’s happening. Keep staring at the gorgeous watercolor illustrations and you will find something new each time. In Flotsam, a curious boy enjoys a day at the beach when suddenly, a huge wave knocks him over and washes up an old underwater camera. Inside he finds a roll of film, gets it developed and what he discovers is pretty amazing; a mechanical fish, a hot-air-ballon-puffin fish and more! Has he discovered the secrets of the ocean?? Each photo is even more fantastic than the first. Perhaps the coolest discovery is a portrait of every child that’s found the camera taking a photo with the portrait photo found before. I love this aspect of the book because we see children from all over the world and throughout time, who, like the young man in the story, discovered the wonders inside the camera. If you have a child with a vivid imagination, they will enjoy this book because it encourages fantasy and creativity. On a rainy day at the zoo, Walrus and Penguin make a break for it. Mr. Zookeeper searches for them throughout the city but they’re just too clever at blending in. This is a silly book that’ll provide lots of chuckles for you and your child. You’ll enjoy searching for Walrus and Penguin on each page. There’s room for discussion and storytelling because the story is wordless. Savage’s signature simplistic, bold digital illustrations are great. If you love this one, be sure to check out the original book, Where’s Walrus? because it’s just as awesome!